The Vegan Ama Balm Everyday is recommended to anyone adventuring outside. Post adventure – An after sun balm to hydrate and revitalise the skin. Outdoor activities include: yoga, running, tennis, volleyball, gardening…the list is endless! Post adventure - An after sun balm to hydrate and revitalise the skin. Ingredients: Certified Organic Coconut Oil, Candelilla Wax, Vitamin E, Rosehip Oil, Raspberry Seed Oil. Available in 30g pot. Please recycle or re-use pot after use. 100% NZ Made natural balms for those who live life outside. Packed with nature's goodies helping skin to prepare and recover. 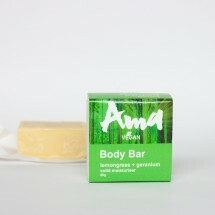 This product is dispatched to you by Ama Balm. Would you like to change delivery destination? Please choose carefully as unfortunately this product is not eligible for our No Worries Return due to hygiene issues. . Please refer to our Returns and Refunds Policy for further information. Our aluminium pots are recyclable and re useable. Vegan, No animal testing on any ingredients. Hand melted and poured in St Johns, Auckland, NZ. Made in St Johns, Auckland, NZ. Only natural ingredients used with majority being certified organic.